3 weeks until Ironman Canada!! Well, I have survived another Ironman training epoch and I have now entered the taper phase. This is the time where my priority is to allow my body to FULLY recover from the stresses and damage that the last few months have conflicted upon it. The ‘damage’ started with the 24 hour HPB record on June 3 – mostly my right knee and my left Achilles tendon. Now, my knee seems like it is recovered, but I have a very tight and sore left hamstring, left IT band and left Achilles tendon. My focus for the next 3 weeks is going to be more extreme than a typical Ironman taper. I am cutting out ALL intensity and endurance work, doing nothing but recovery work between now and race day with a few short, race-pace intervals placed in when I think I can handle it. This means daily easy bike rides of 100 to 130 watts, and daily walk-runs. I will still maintain a similar swimming program as before – 3 times a week for about an hour each session. I know from experience that recovery happens when you are ACTIVE, not when you rest. Your body tends to go into a state of suspended animation when you sit around all day – Injuries just sort of stick around, as there is no pressing reason for your body to fix them, so it doesn’t. If you are doing nothing, then your body does the same regarding it’s injuries. The way to recover is to be active to the point where you are not further stressing the injury. By doing this you are telling your body that you still require the use of the injured parts, and that it had better fix them. Or you might get eaten by the saber tooth tiger. If you are not using it, then your body thinks you don’t need it anymore and as a result, it does not allocate any resources to the repair work required. “Use it or lose it” is my recovery mantra. My last big training day was with Greg B. This is tradition – before every Ironman, we finish our training with an epic 9 to 10 hour training day. This was a 216 km ride from hwy 40 at the Trans Canada, up to the summit of Highwood Pass, down the back to Longview, then around to Bragg Creek. 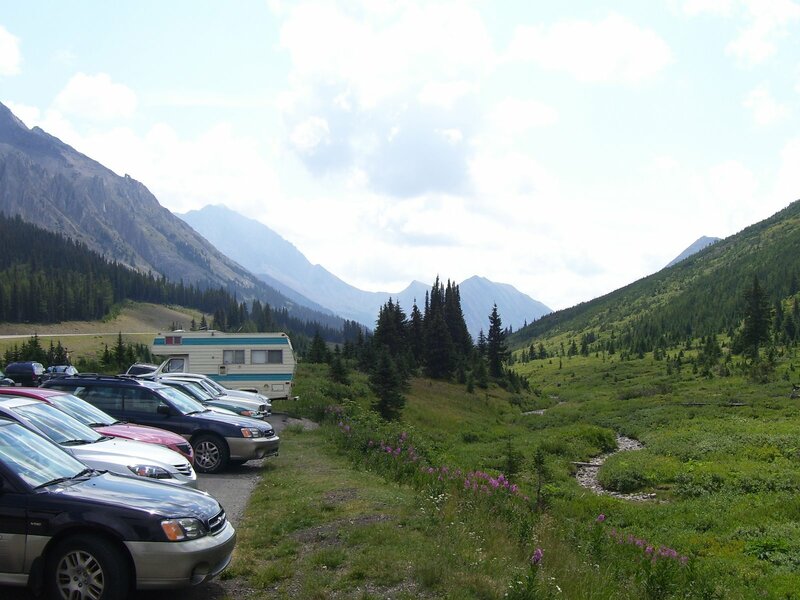 We had driven and parked two cars in the morning before we headed out. 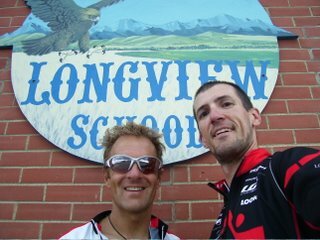 We also inserted two, 20 minute runs into the bike ride – the first at the top of Highwood pass and the second in Longview. It was a great day despite getting soaked with rain through a few thunder showers. 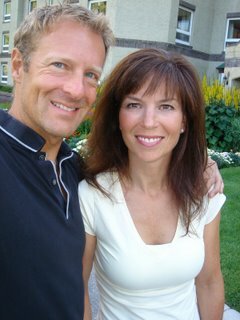 Helen is also doing Ironman Canada on August 26th. As I mentioned in a previous blog post, we like to escape on the weekend by cycling to Banff, staying in the Banff Springs Hotel and then doing a long trail run the next day. The long training weekend finishes with a 120 km bike ride back to Calgary. We’ve done this 4 times this season, and it’s really a great way to keep the training fresh and fun. This is the 25th anniversary of Ironman Canada – the oldest Ironman race in the world next to the original Ironman world championships which is in Kona, Hawaii. 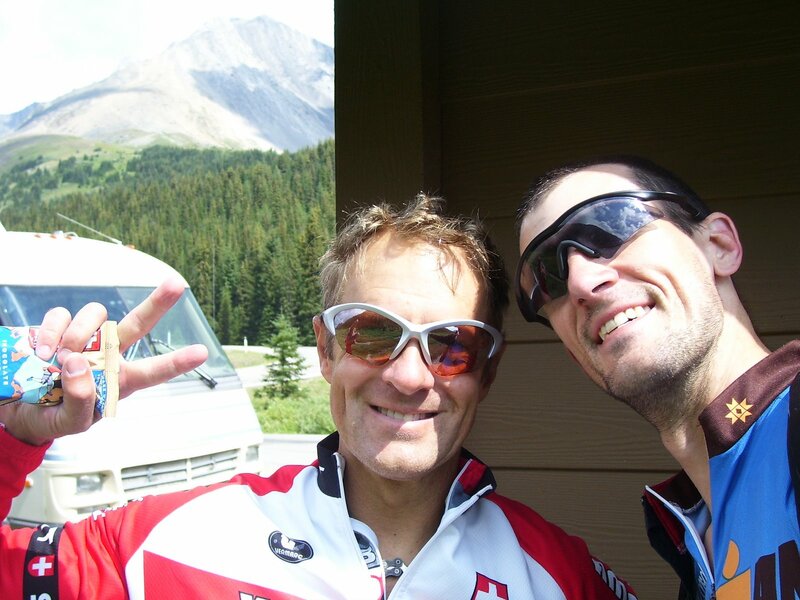 The last time I did Ironman Canada was in 2004. According to my race report, I did a 5:15 bike split and blew up on the run finishing in about 12 hours. I ‘would-have’ qualified for Kona again in Arizona earlier this year if it wasn’t for two flat tires on the bike. To solve that issue, I am going to give a new product by Vittoria a try. It’s called Vittoria Pitstop ( Vittoria Pit Stop ). It is a small canister that will inflate and seal a flat tubular tire. I testing it out on an old tubular that I have and it worked really well. I punctured the tire by hammering a nail through it, then simply inflated the tire using the Pit Stop product. It pressurized to about 100 psi which is good enough to get me to the finish line and it took all of about 1 minute to do! You don’t have to take the wheel off, or mess around with trying to pry your tire off the rim. you don’t even have to carry any of the heavy tools or spares with you – just a small canister of Vittoria Pit Stop – pretty nifty! The tire eventually went flat again in about 3 hours, but after re-pressuring with a Co2 cartridge, it stayed fully pressurized for the next week. I would recommend taking a couple of Co2’s along on race day just to be sure than it the tire started to lose too much pressure, that you could top it up with the C02. I think this largely depends on the size of the puncture. In my test, I used a fairly large nail, so it was probably a bigger hole than your typical puncture. My plan at IMC is to do what I can with the swim – I’m a slow swimmer and nothing I have done over the last 7 years has resulted in any appreciable decrease in my Ironman swim time, so I will be satisfied with an hour and 10 to 15 minutes. According to the SRM data that I have from past races, I know that a 5 hour bike split in Arizona equates to a 5:10 in Canada, so that is what I would like to do. I was using Pyro Platforms on my bike with water socks, but I recently switched to wearing my running shoes with the Platforms. The reason I was using the platforms with socks is because i found that by providing a FLAT platform for my foot without the restricting shoe, that my feet were not sore after I came off the bike – a problem that has plagued me in the past. I also discovered that when you pull up with your leg on a pedal stroke, that mostly you are just pulling up the weight of your leg and not really adding much to power moving you forward. I found that I could pull up just as well in the platform without any kind of strap holding my foot down to the pedal as I could with a shoe. In testing with my SRM, there was no difference between using a traditional bike shoe, or my platforms with socks (or bare feet). The reason I switched to using a full running shoe in the platform is that I figured i could save a couple of minutes at transition by being able to run direct from my bike out to the bike course without having to stop in transition. Since all that I required from my T2 transition bag is my running shoes, I am good to go directly from my bike. After a slight seat height adjustment, wearing the running shoes on the platform feels no different than wearing the aqua socks, and for time trial distances like Ironman, I do not see any valid reason to wear tight, restricting, uncomfortable bike shoes. After my 15 second T2 transition, I hope to better my 3:50 running performance at Ironman Arizona in 2006 where I came in 4th in my division and qualified for world championships. If the plan is successful, I will finish between 10 and 10:15 which should be good enough for a Kona slot. Greg, your rich experience base makes your perceptions about how best to guide our bodies through recovery periods will cause me to instantly follow your advice. Great information. Good luck to you and Helen in you upcoming events. I think we typically underestimate how long the effect of endurance training stays with us when we become less active. When I trained for my first 24 hour distance record attempt in Alabama, I had to stop my training THREE WEEKS before the attempt in Alabama because the weather turned bad. It was November and the snow started falling big time. Also I was super busy with tons of last minute fixes and preps with the vehicle and other logistics for the attempt itself. As it turned out, I hadn't done more than a few hours of cycling for 3 weeks when I was able to hold my target watts pace for 20-some hours – no problem at all. On top of that, I was sicker than a dog. The day before the 24 hour record attempt I was up most of the night caughing my brains out! 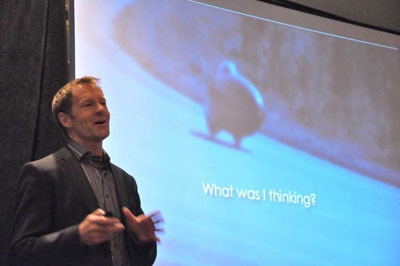 Amazingly, lack of sleep, lack of recency in training, and being sick had very little effect on my performance. We spoke briefly at IM Arizona 2006 after finishing within seconds of each other. I'll be doing my first IM Canada this year and hope to see you there. My running speed is better than in 2006, bike is similar, and swim is slower (doh!). I've been enjoying your blog for some time now but haven't posted before. Came across this completely by accident and having read more of your blog am loath to question you but I would be surprised if this simple exercise did not show that cycling shoes provide greater power on the upstroke. Find a quiet road which gradually get steeper. Start cycling with only the tips of your fingers touching the bars. When settled take one foot off the pedals and continue using just one foot. Continue till you are forced to a stop. See which, pyro or cycling shoe, gets you further. With a decent pedaling action, which I reckon with your experience you have, and properly fitting shoes I would be very surprised if the cycling shoes did not show that there is power to be had and more than available with the pyros.